Not 48 hours after the apparent fall of Aleppo, and Republicans in the US are running amok to score political points on how this is a reflection of the failures of US intervention. The shame, in the fall of Aleppo, lay not in those that suffered under a siege that has lasted more than two years, but in the fact that the US will now be seen in a weaker light, unable to support whatever exploit of intervention to come up next. The fall of Aleppo, for the Republicans, is a black stain on the legitimacy of the US in a global context—one that reflects on Obama’s policies of removing troops from Iraq and not pursuing a more decisive intervention in Syria. On the other hand, democrats and progressives, currently preoccupied with their war against the normalisation of Trump, have ironically lost touch with the multitude of issues they have passively normalised over the years. From the US’s nearly 800 foreign military bases, the presence of the maximum security prison at Guantanamo bay, an illegal war in Iraq, and shoddy arms deals with totalitarian regimes. With this, it seems that the only thing that continues to hold the US together is the implicit, bipartisan agreement that the US could tread the waters of international law with exceptionalism and moral righteousness, and the only thing worth differing on is the extent of said intervention. The irony/tragedy in all of this is the hubris that the US government must poses to continue speaking of its legitimacy in the Middle East. With a record of flip-flopping between intervening against or supporting dictators, the interpretation of US foreign policy can only belong to one of two camps. Either, the US is a country that deeply misunderstands this region with unspeakable flaws in its security, intelligence, and national security apparatuses; or, the US is truly operating on an imperialist basis supporting or intervening when it best suits. Neither of these camps are as exceptional or as moral as American politicians would have you believe. This exceptionalism is easy to pander to, as long as the focus is moved away from the US. And since, in the greatest nation on earth, criticising foreign policy and US intervention (especially in a republican sphere) is near equitable to treason—the blame can only lay outside of its borders. With this the US, continues to present Russia as its polar opposite, and Russia relishes in the spotlight, capitalizing on the holes in US foreign policy rhetoric. This is not to say that there exists a lesser of two evils in this tango, and it is warrant enough to say that two wrongs don’t make a right. 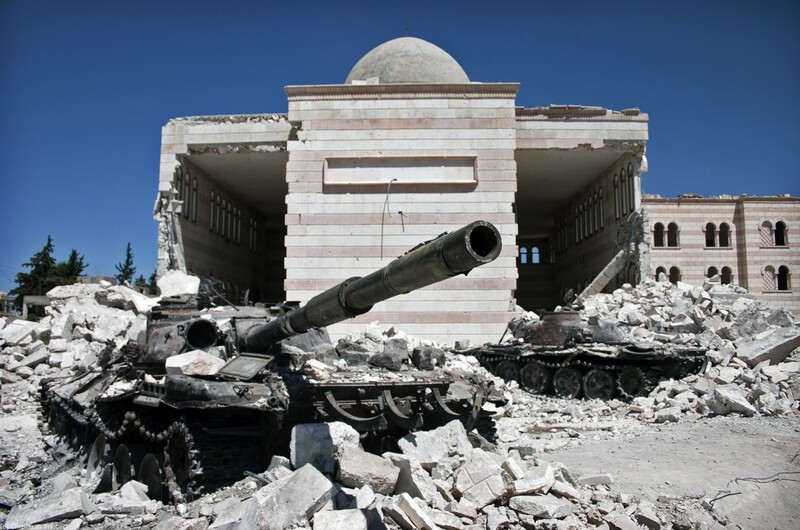 Russia’s intervention in Crimea, the Ukraine, and Syria leave much to be fearful of. Nevertheless, if we are searching for objectivity, we cannot look at Russian foreign policy while ignoring the duality in the US’s NATO push in Eastern Europe, and the continuation of a policy of containment. We cannot ignore the perceived threat this provides to Russian international demeanour, and continue demonising one sort of intervention while crowning another as moral. Away from international relations is the continuous politicisation of the conflict within Syria itself. Yesterday, a video was released of an independent journalist retorting on “western” journalism and their coverage on the war in Syria. In the video the journalist makes valid accusations on the lack of “verified” sources on the ground within Aleppo, accusations on the partisanship of the White Helmets, and finally a claim that the coverage seeks to promote the conflict as a civil war, something the speaker seemingly dismisses. It would seem that the speaker would much rather follow the narrative propagated by the leader dropping barrel bombs on “terrorists” than entertain the notion that civilian deaths do not need to be witnessed and corroborated by “verified” sources to make the politics of a civil war behind them real. Sure, we might not know where the raw footage of barrel bombs, civilian protests under fire, or children being pulled out from under the rubble is coming from within Syria, or whether or not the footage is recent or not. But the facts remain, there is one side that possess helicopters and warplanes, and irrespective of whether or not you call them rebels, terrorists, or freedom fighters, civilian casualties are still amassing in the fight against them and it is clear on whose order. The reporter’s claim is largely based on the idea that western media has an “agenda” and that very agenda is, you guessed it, an imperialist intervention in the welfare of the Middle East—which is seen as a continuation of the interventions in Iraq and Libya against the will of the majority. To establish this message it seems that not only does the US need to be discredited, but also the impact of this war on civilians. Today, there is more news on the suffering of these civilians which will in no doubt continue to be dismissed. The UN has reported on the summary executions of at least 82 civilians in the eastern side of Aleppo. Unfortunately, as the war continues, and international relations continue to unfold on the premises of “beware the other side”, these civilians will continue to be nothing but the statistics in the months to follow the end of the war. The interrelations of their lives providing nothing more but the next subject of study in a contemporary IR course of study at a university, or the fuel for an intellectual debate on the ethics of journalism in conflict areas. In the coming months, perhaps even days, the world will turn its eyes to more analysis on how the Syrian government will handle the Kurdish presence in the north of the country. Turkey will continue to be in the spotlight as an ally (?) in the fight against ISIS, as it continues to threaten Europe with opening the “refugee floodgates” unless the EU keeps paying them not to, even though proof of Turkey “accidentally” arming extremists has come to light. The US and the UK will continue to supply Saudi Arabia with arms for its war in Yemen, even though proof of the kingdom “accidentally” funding extremists has come to light. And Russia will continue to be presented as the counter-balance to the “Western world”, while the western world continues to be presented as having an imperialist agenda by the Russians. If we are to wish for any recourse, it is that politicians on both sides of the global aisle, and indeed voters (on one side of the global aisle), shed their exceptionalist world views, and stand for a more consistent and humanitarian approach to international relations. It is only with the rejection of this self-imposed divide, which pays no attention to human suffering — unless it is seen to further calls for intervention — can we move away from archaic foreign policies and attempt to preserve the life of civilians. Unfortunately, I cannot remember a time where spilt blood ever led to the silence and reflection of politicians and despots. Become a Patron for 5$ a month and help us continue producing thought provoking and actionable articles.